... Where music and summer fun are serious stuff. ​We're taking a different twist this year and exploring what can possibly be so fun about making music. Chamber music is not just for stuffy guys with wigs! These days, chamber music really just means making music with friends... it can be genre-bending, cross-cultural, history-mindful rock music, unplugged (sometimes!) and unadulterated. Join us and make some great music! Our program includes a full-day camp for students going into grades 1-12, Wednesday evening Faculty concert, and Friday afternoon student concert. This camp is also a part of our SRSLY. CHAMBER MUSIC FESTIVAL, and the concerts will be publicized as part of the festival. Read on to find out more about the camp. DO YOU LOVE TO PLAY MUSIC? ​Calling all school-aged violinists, violists, cellists, guitarists, and bassists! New to violin? Interested in trying it out, or recently started? Join our beginning violin division! Students going into Grades 1-12. May 1 for non-beginners, to allow time to practice music ahead of the camp. WHAT IS A STRINGS & CHAMBER MUSIC CAMP? A place where friends, old and new come together to jam on fun music. Work with our incredible coaching team and learn what it takes to play well together! We will place you in a group that is just right for your level. A fun way to improve your instrumental, sight-reading, and musicianship skills. 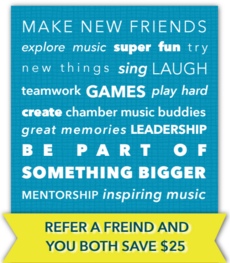 A friendly way to learn something new about music, teamwork, and what YOU can do! Activities include: Ensemble rehearsals and coaching with ASA’s awesome faculty, choir, fun teamwork and musicianship games, outdoor time. Pick-up is between 3:55-4pm, M-F.
Sign up by July 1! Available on M-TH, 4-5:30PM. $60. Full payment for the camp is due at time of sign-up. Before April 1: Receive a full refund for cancellations before this date, minus $25 administration fee. April 1-May 1: Receive a 50% refund for cancellations. The Medical Permission and Release Form. The Medical Permission and Release Form must be completed and submitted by check-in on the first day of camp in order for a camper to attend. You may email a scan, snail mail a physical copy, or hand it in in person at check-in on the first day of camp. Please download a copy here: https://drive.google.com/file/d/0B-nzmn9EuBQtMmNKM0E1S3pZWW8/view?usp=sharing. Students are required to provide their own instruments and folding music stands for the camp. If your student is a beginner who does not already have an instrument we recommend renting an instrument (even if you plan to continue lessons after the camp). In fact, renting is preferable until your student is sure they want to continue and you have the benefit of an expert teacher to help guide your search. Attendance at all camp functions. The curriculum is individually tailored and team-oriented. Music is assigned to each musician well in advance of the camp (with the exception of beginners), and, because of the nature of chamber music/group playing, musical ensembles often have individual parts assigned. If one person misses rehearsal, the whole group loses out. Additionally, the Wednesday evening Faculty Concert is also an important part of the camp curriculum, as it provides an opportunity for students to be inspired by seeing their teachers in action. Therefore, each student’s full participation is integral and required. As soon as registration ends (on May 1 for non-beginners, June 1 for beginners), we begin assigning music to campers. Music assignments will be shared via email and Google Docs in early June. Campers are expected to prepare their own music folders and print music out to bring to camp. They are expected to make every effort to learn the music in advance of the camp… but don’t worry if you hit a hard spot! Bring it to your private teacher to work on, and your camp coaches will help you out during the week, as well. List some pieces you've played recently. Deadline to sign up for after-care is June 1. Did you refer a friend to the camp, or were you referred to the camp by a registered camper? Put your camp buddy's name here. Following the registration period, we will tally the referrals and send you a check with your $25 refund.